Above a sea of black T shirts, a kid with more tattoos than sense is crowd surfing. On stage, bands with names like Painkiller and Burgerkill are crunching out earsplitting chords and frenetic solos. The bill features no less than 24 groups and the event is called Headbangers In Hellbut this is not a college hall in London or a dive bar in Los Angeles. This is JK7, the latest venue in Jakarta to fall under the sway of an underground music scene bursting with bands playing everything from death metal to electronica. To put the number of bands in circulation in perspective, more than 1,400 acts recently auditioned for 12 spots on a CD compilation sponsored by a tobacco companyand that didn't include groups from Jakarta. Among the winners was Vox from Surabayaa band that will also release its own CD on Aksara Records, Indonesia's premier independent label. Vox's signing brings the number of bands on Aksara's roster to nine. They include rising stars Goodnight Electric and the Adams, who scored a No. 1 hit last year on Rolling Stone Indonesia's Top 10 list, beating out far larger, mainstream acts. "The fact that independent bands are getting radio play and packing venues is a sign that things are really changing in the music industry," says Ricky Siahaan, who spends days as the senior editor at Rolling Stone Indonesia and nights as a guitarist for top metal act Seringai. Sales are moving up a gear too. 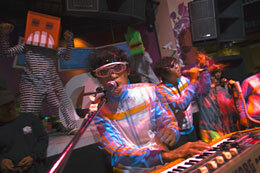 Mocca, a Bandung group, sold more than 75,000 copies of their most recent album, a record for a band on an independent Indonesian label, while Superman Is Dead, from Bali, hit 65,000 with their last effort. These are totals that any underground band anywhere in the world would be content with. "In the region, Indonesia is in a category by itself," says Siahaan. It's hard to say why that's so. One theory is that unlike its more affluent neighbors, Indonesia has not benefited from wide distribution of foreign music, so kids make the music they want to hear themselves. The desire for a distraction from poverty and boredom is also thought to be a driving forceas it was with American hip-hop or British punk. But what is certain is that the country's underground music scene is in rude health indeed. "We never thought our music would get radio play and were surprised when they asked us to play on air," says Sir Dandy, vocalist for the splendidly named Teenage Death Star. "It's cool that our music can now be heard but we basically just want to rock." Forget pictures of flooded kampongs or rampant deforestation for a moment. The image of modern Indonesia can just as easily be depicted by hirsute young men, tongues lolling, playing deafening guitar.